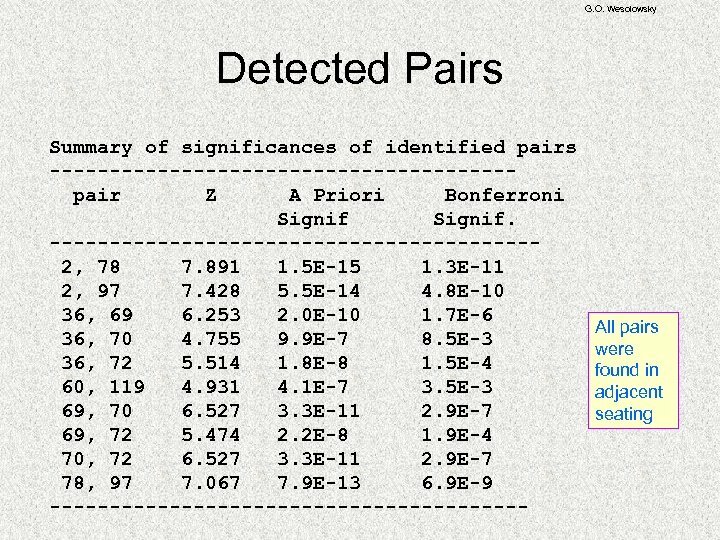 G. O. Wesolowsky Some Statistics (CAI) plagiarized text CAI Research Conducted By Don Mc. 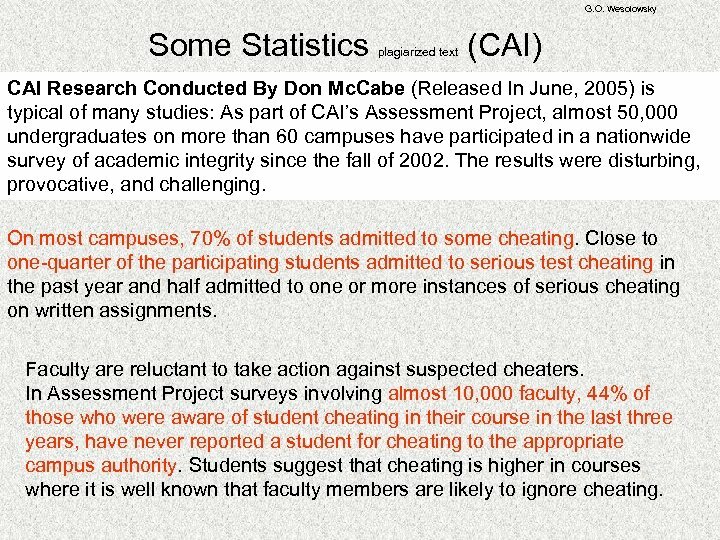 Cabe (Released In June, 2005) is typical of many studies: As part of CAI’s Assessment Project, almost 50, 000 undergraduates on more than 60 campuses have participated in a nationwide survey of academic integrity since the fall of 2002. 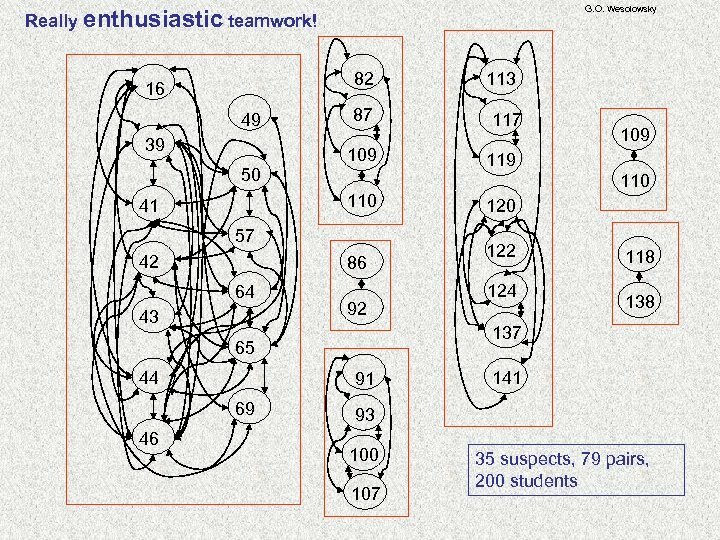 The results were disturbing, provocative, and challenging. 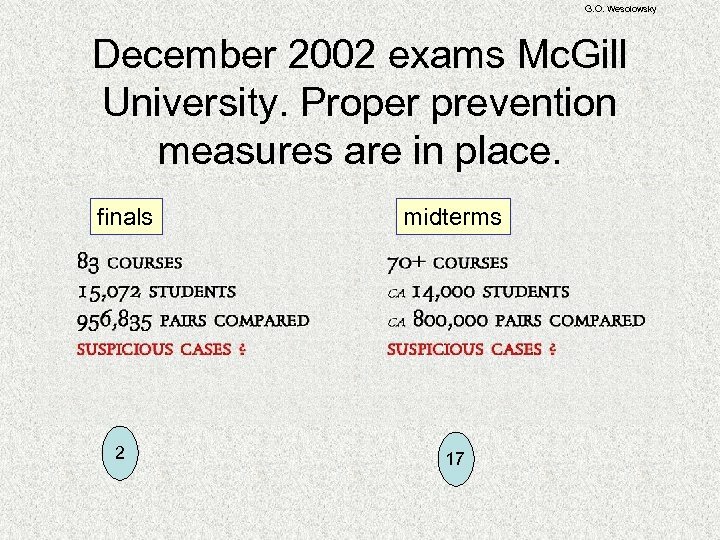 On most campuses, 70% of students admitted to some cheating. 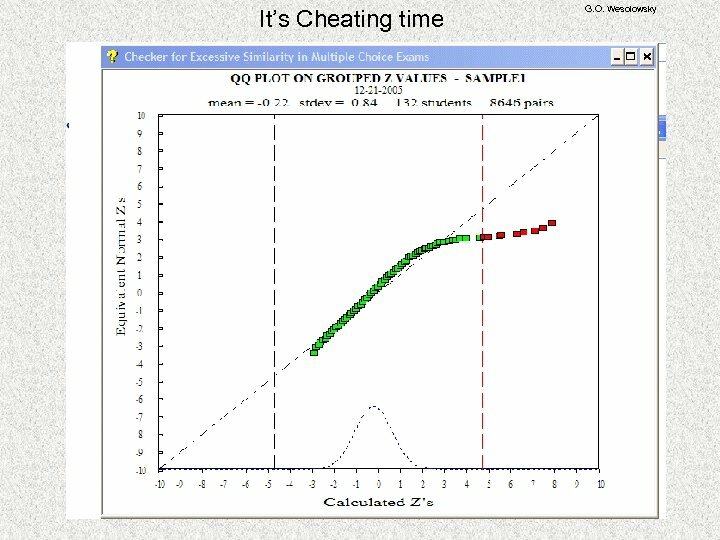 Close to one-quarter of the participating students admitted to serious test cheating in the past year and half admitted to one or more instances of serious cheating on written assignments. 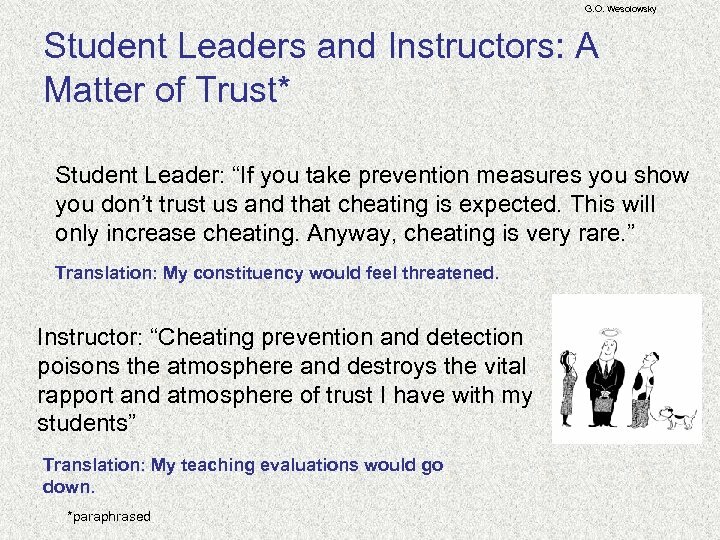 Faculty are reluctant to take action against suspected cheaters. 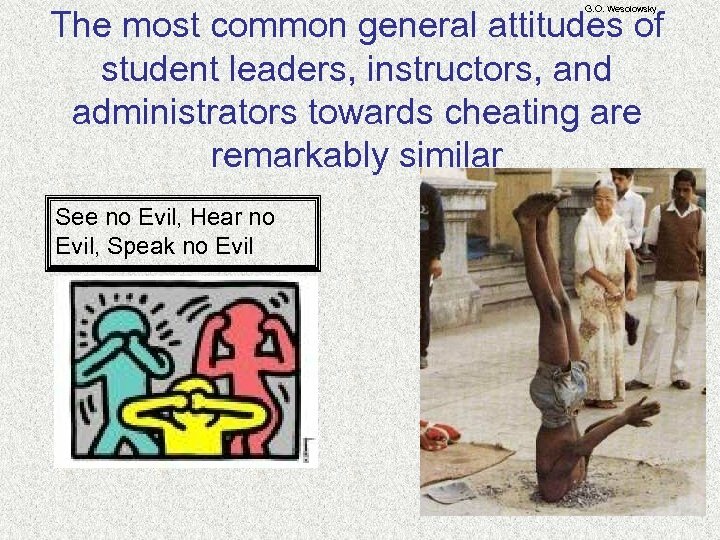 In Assessment Project surveys involving almost 10, 000 faculty, 44% of those who were aware of student cheating in their course in the last three years, have never reported a student for cheating to the appropriate campus authority. 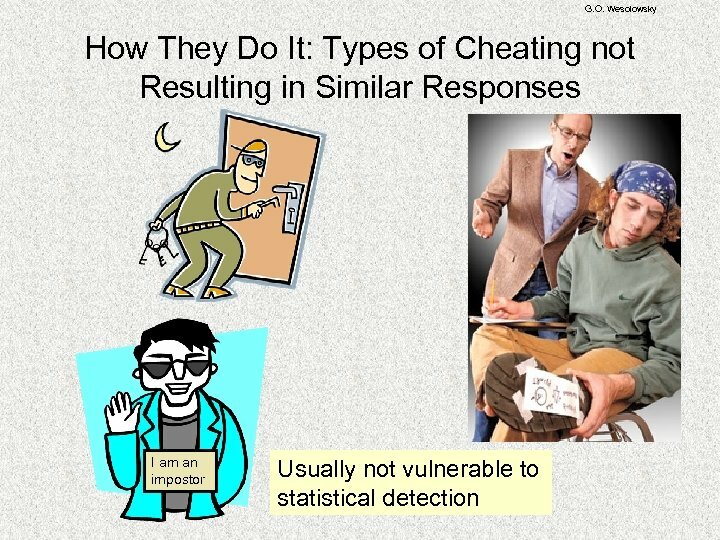 Students suggest that cheating is higher in courses where it is well known that faculty members are likely to ignore cheating. 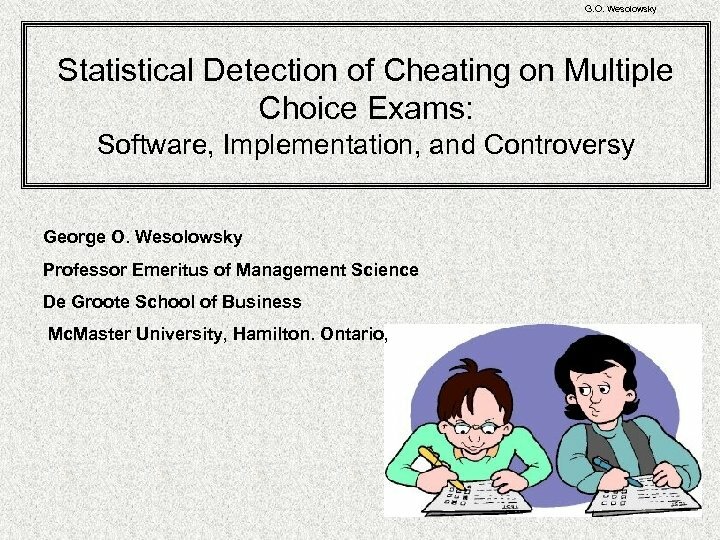 Questionable Statistical Detection G. O. Wesolowsky It is not infrequent that instructors, when confronted by a suspected cheating situation, invent their own methodology on the spot. 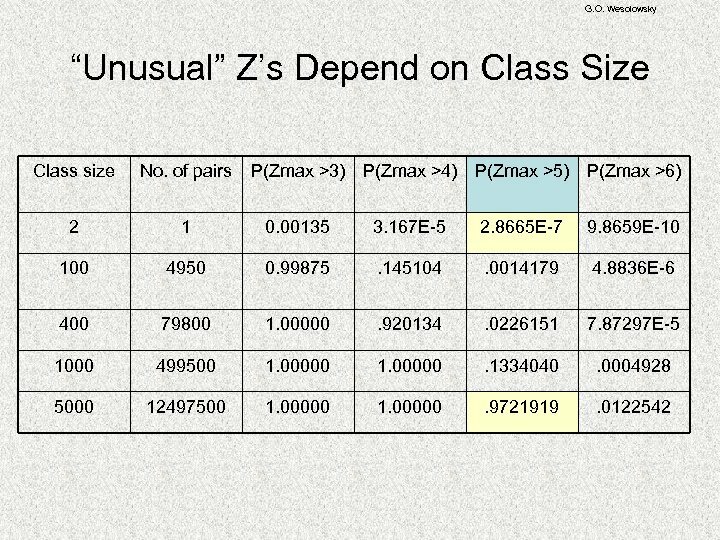 This is usually what I call ‘outlier methodology’. 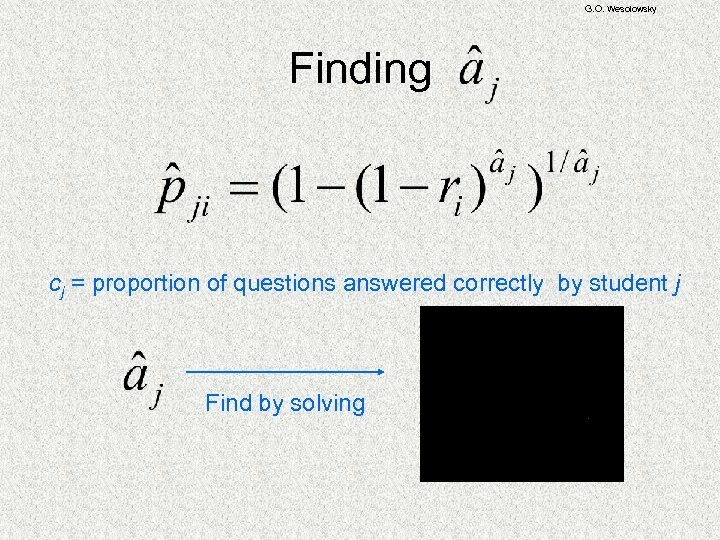 The basis is some way of using the number of wrong answers that two students have in common. 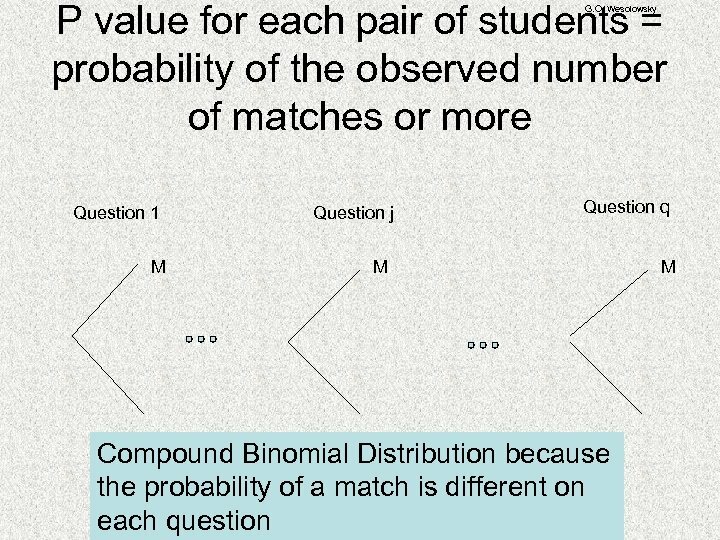 It could be simply a count of such 'wrong matches', a proportion, a run length, a ratio with other counts, or a multivariate plot of such variables. 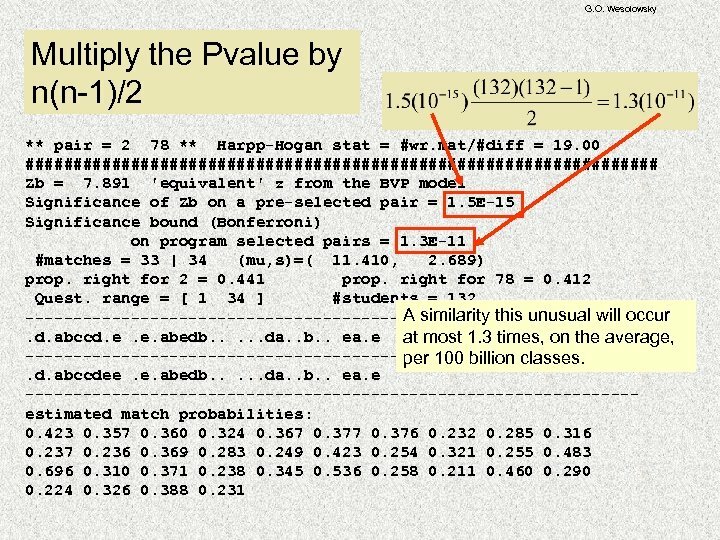 The idea is to look for outliers and attribute them to cheating. 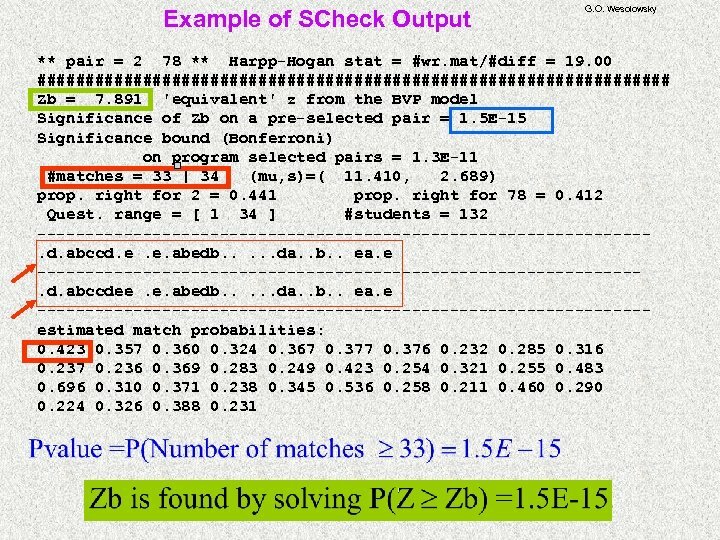 G. O. Wesolowsky But then: The instructor wrote a program: “My script just returns any match that has a high percentage of matching errors (and sufficient errors to convince you that some thing's up!) 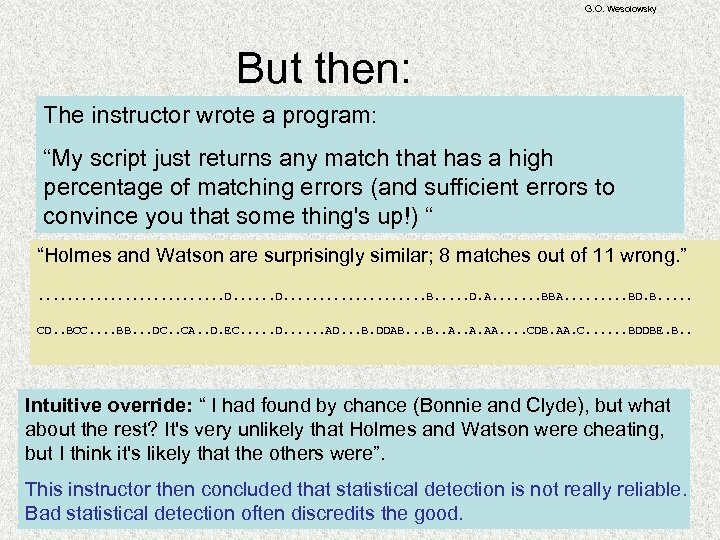 “ “Holmes and Watson are surprisingly similar; 8 matches out of 11 wrong. ”. . . D. . . B. . . D. A. . . . BBA. . BD. B. . . CD. . BCC. . BB. . . DC. . CA. . D. EC. 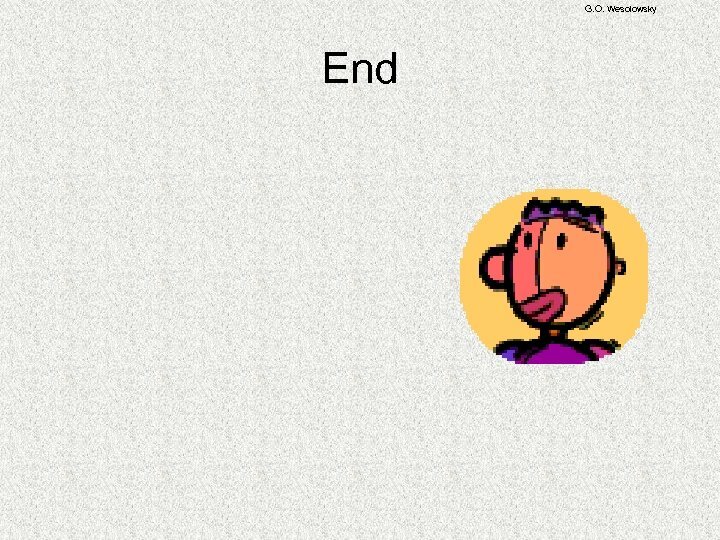 . . D. . . AD. . . B. DDAB. . A. AA. . CDB. 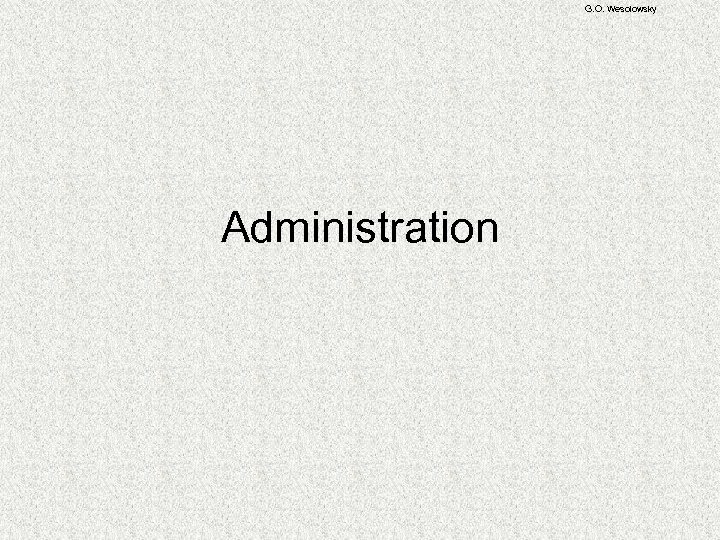 AA. C. . . BDDBE. 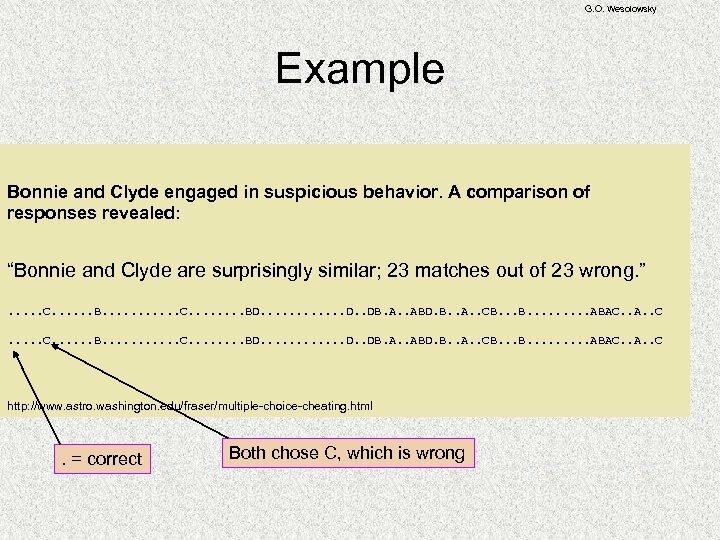 B. . Intuitive override: “ I had found by chance (Bonnie and Clyde), but what about the rest? It's very unlikely that Holmes and Watson were cheating, but I think it's likely that the others were”. 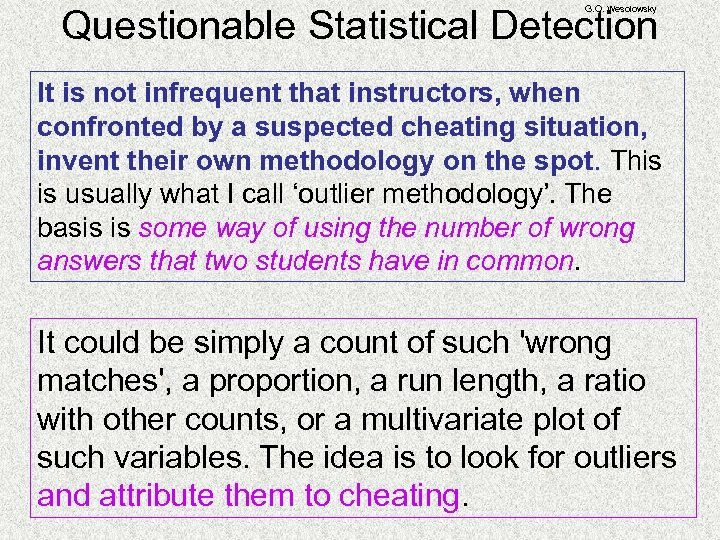 This instructor then concluded that statistical detection is not really reliable. 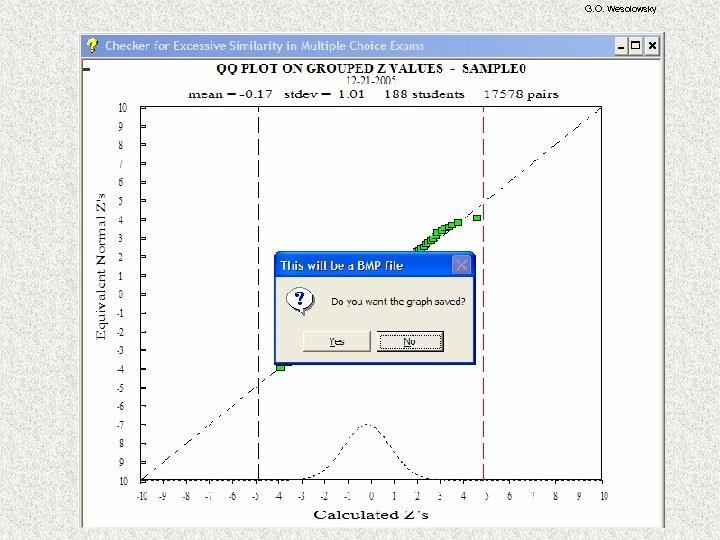 Bad statistical detection often discredits the good. 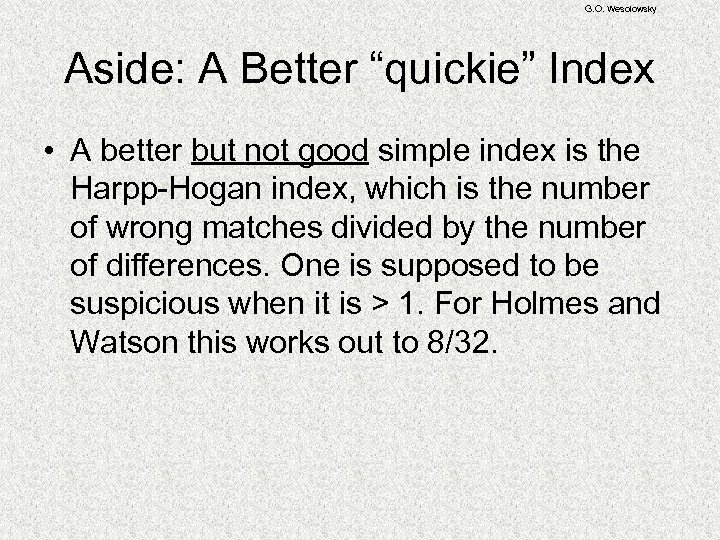 G. O. Wesolowsky Aside: A Better “quickie” Index • A better but not good simple index is the Harpp-Hogan index, which is the number of wrong matches divided by the number of differences. 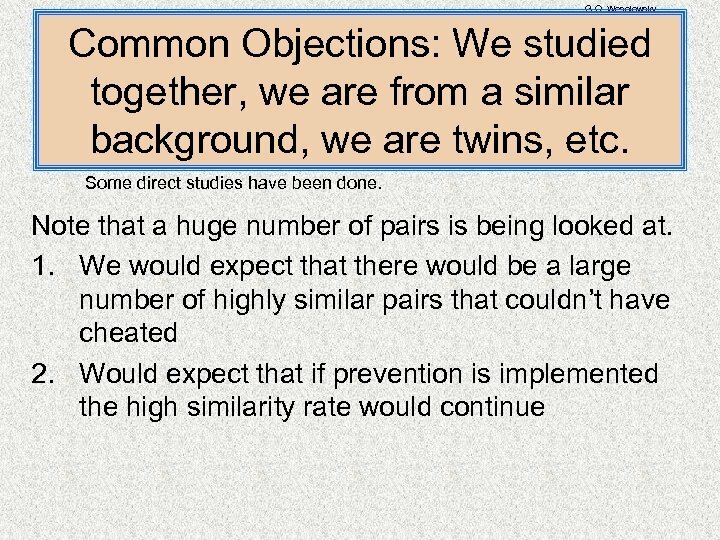 One is supposed to be suspicious when it is > 1. For Holmes and Watson this works out to 8/32. 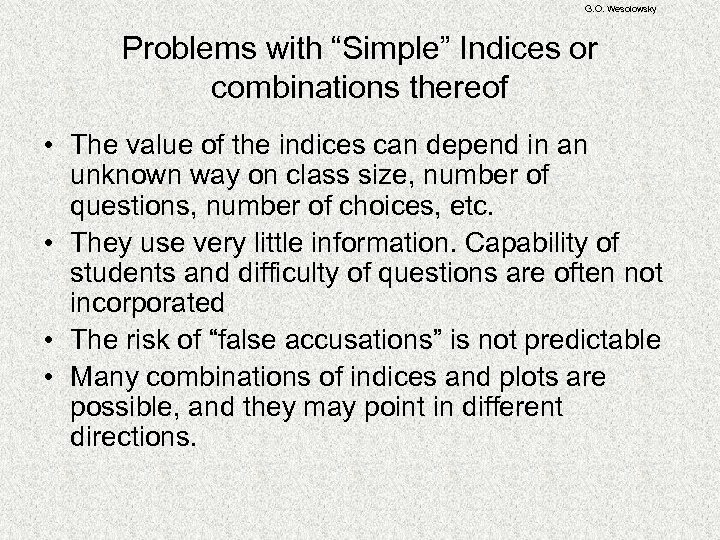 G. O. Wesolowsky Problems with “Simple” Indices or combinations thereof • The value of the indices can depend in an unknown way on class size, number of questions, number of choices, etc. • They use very little information. 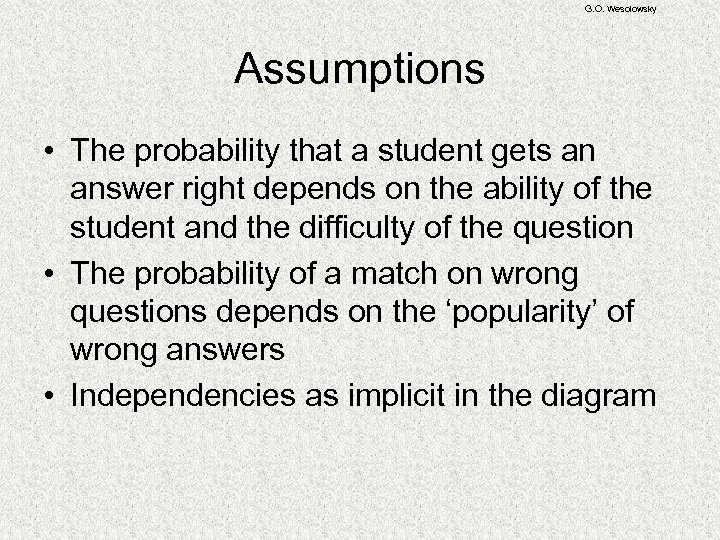 Capability of students and difficulty of questions are often not incorporated • The risk of “false accusations” is not predictable • Many combinations of indices and plots are possible, and they may point in different directions. 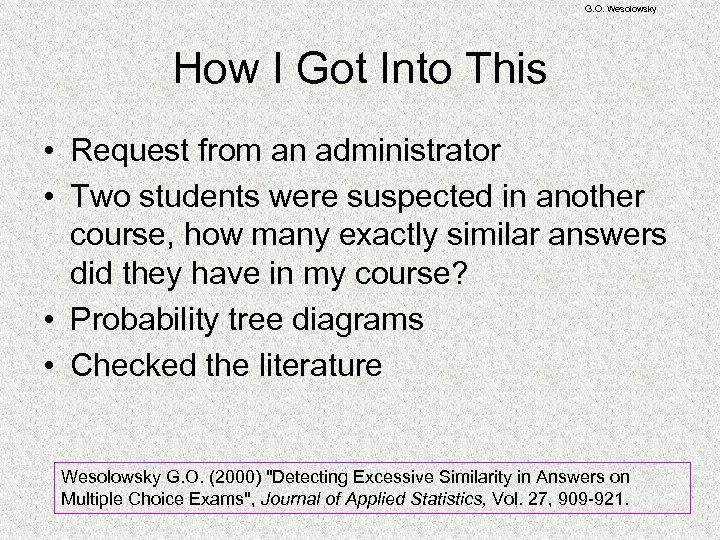 G. O. Wesolowsky How I Got Into This • Request from an administrator • Two students were suspected in another course, how many exactly similar answers did they have in my course? 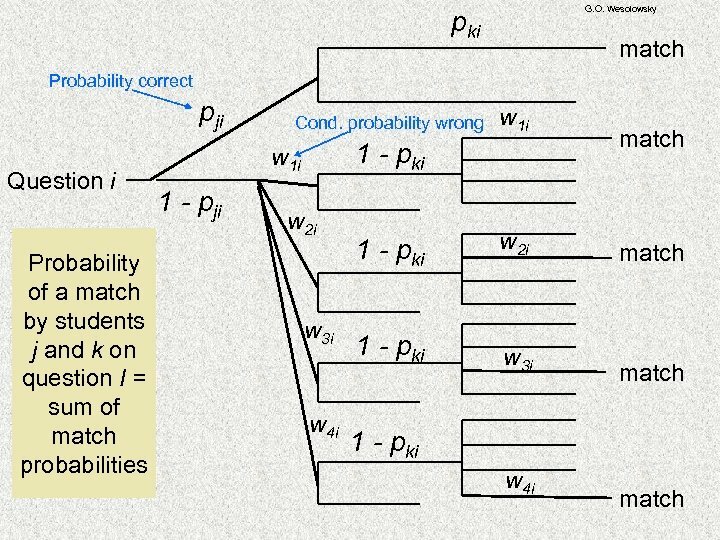 • Probability tree diagrams • Checked the literature Wesolowsky G. O. 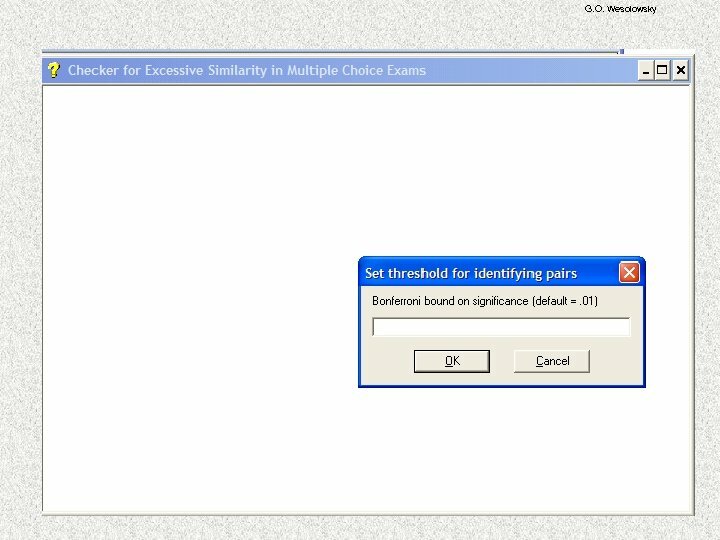 (2000) "Detecting Excessive Similarity in Answers on Multiple Choice Exams", Journal of Applied Statistics, Vol. 27, 909 -921. 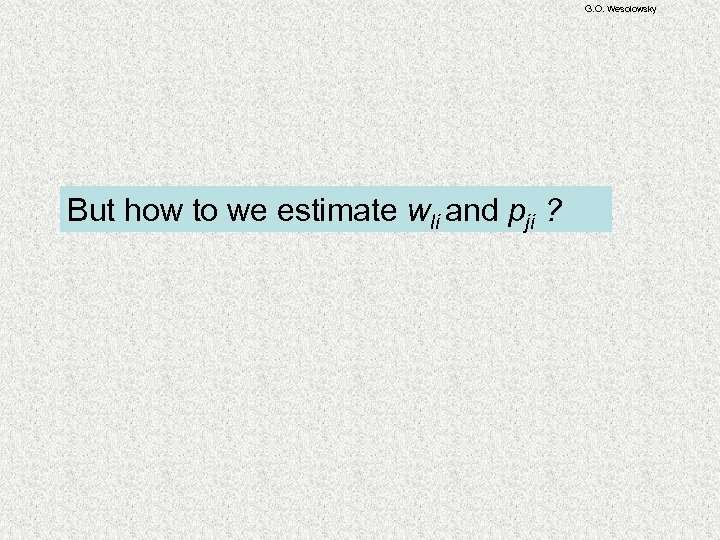 G. O. Wesolowsky But how to we estimate wli and pji ? 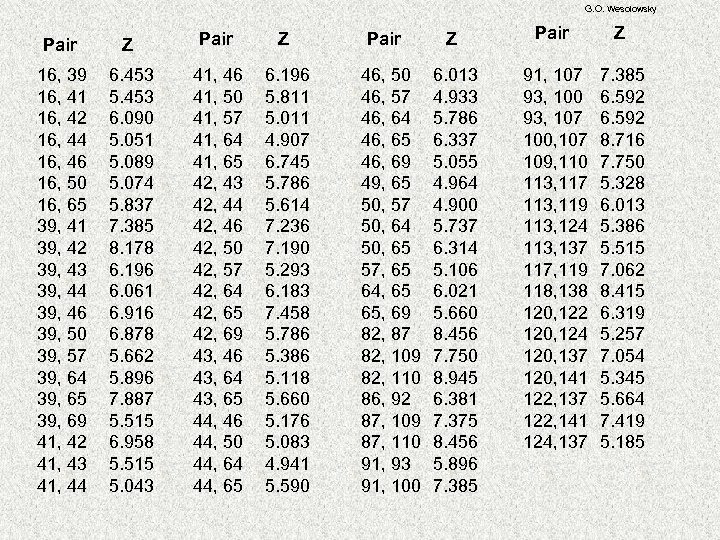 G. O. Wesolowsky This box and the previous one allow selection of a block of questions. 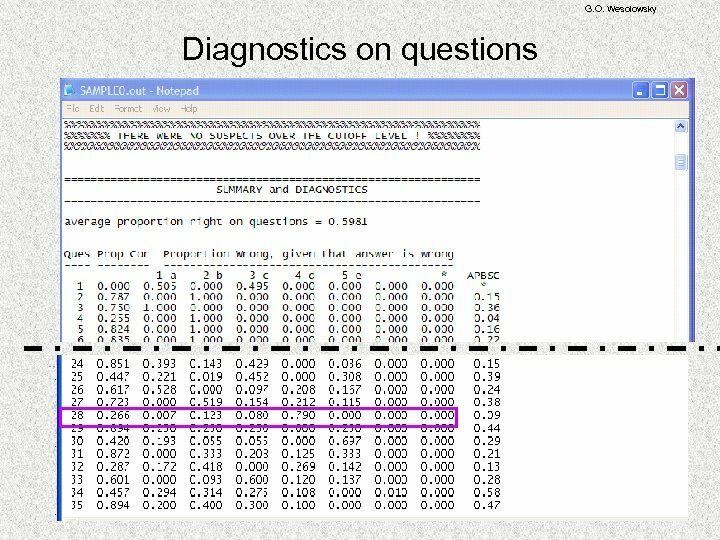 Useful if, say, some questions only gather information. 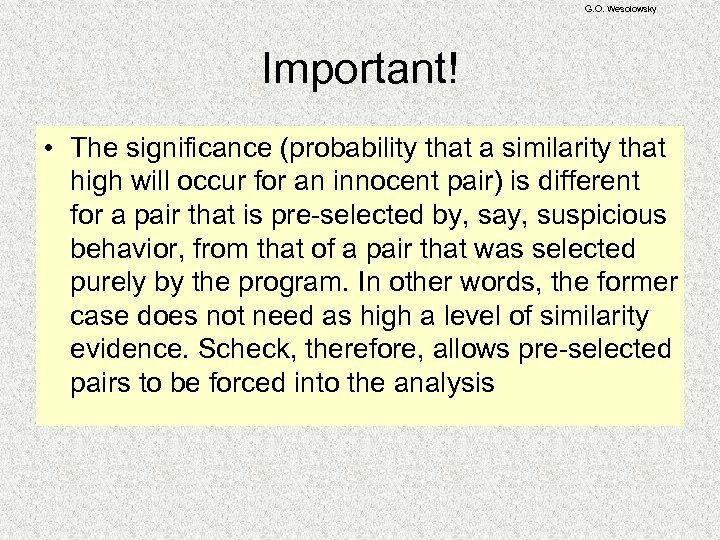 G. O. Wesolowsky This forces suspect pairs into the output for analysis. 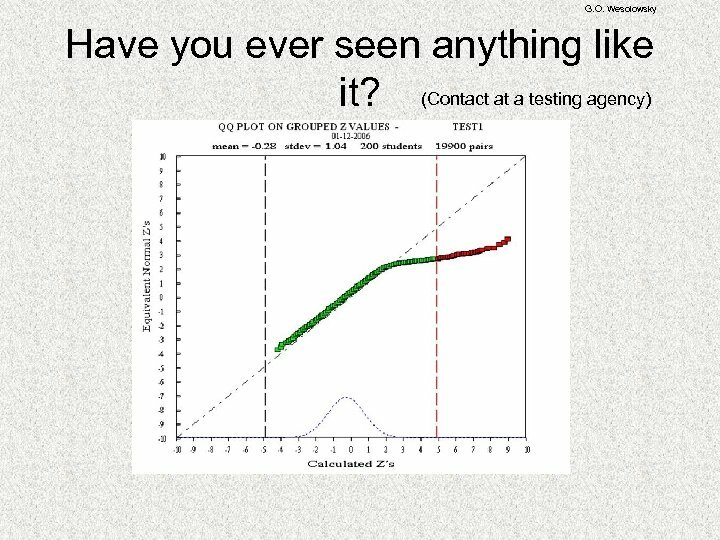 G. O. Wesolowsky Both expectations have been proven false in thousands of data sets. 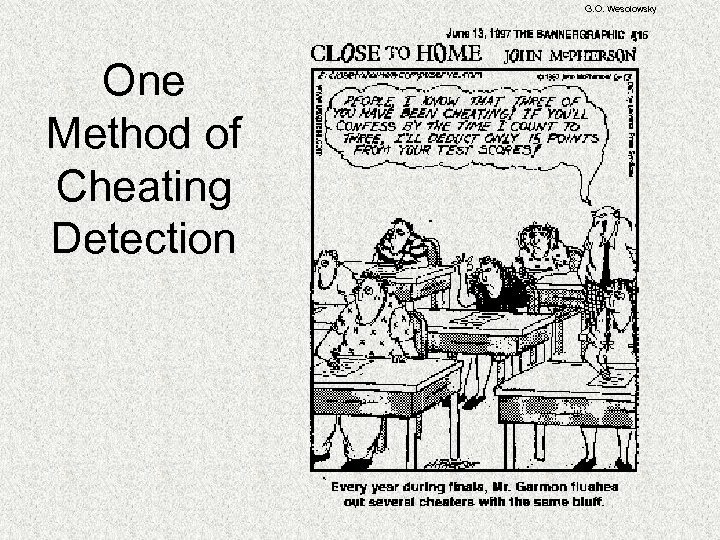 Prior to electronic cheating methods, no very high similarities lacking the opportunity to cheat (adjacent seating) were found. 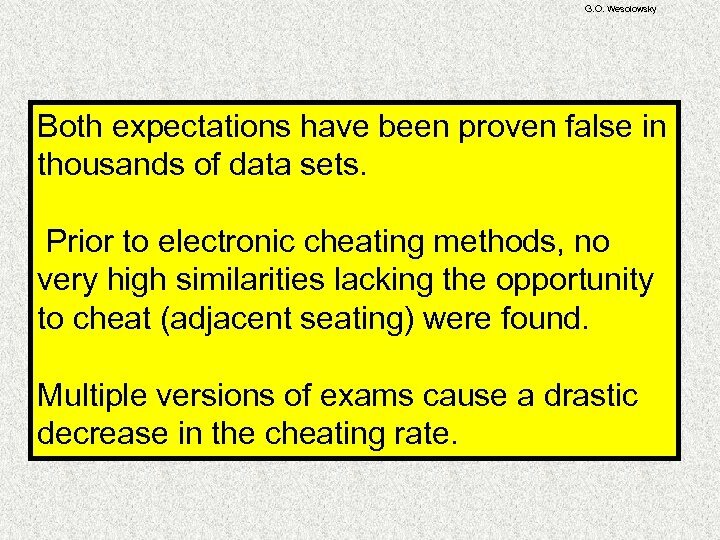 Multiple versions of exams cause a drastic decrease in the cheating rate. 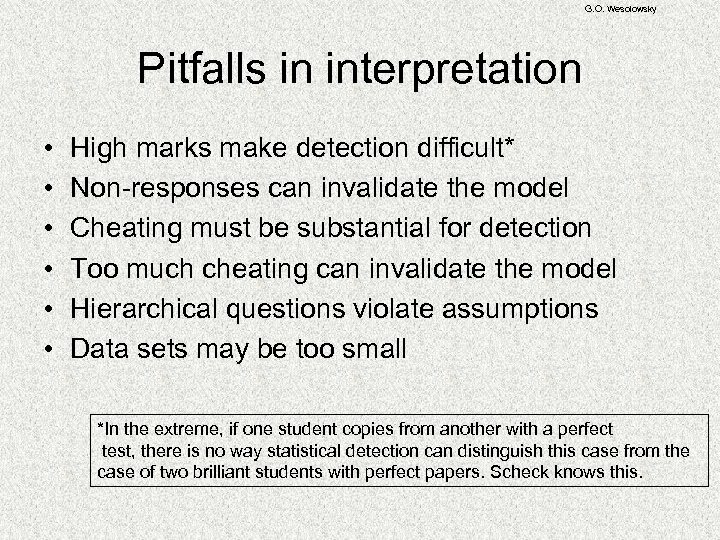 G. O. Wesolowsky Pitfalls in interpretation • • • High marks make detection difficult* Non-responses can invalidate the model Cheating must be substantial for detection Too much cheating can invalidate the model Hierarchical questions violate assumptions Data sets may be too small *In the extreme, if one student copies from another with a perfect test, there is no way statistical detection can distinguish this case from the case of two brilliant students with perfect papers. 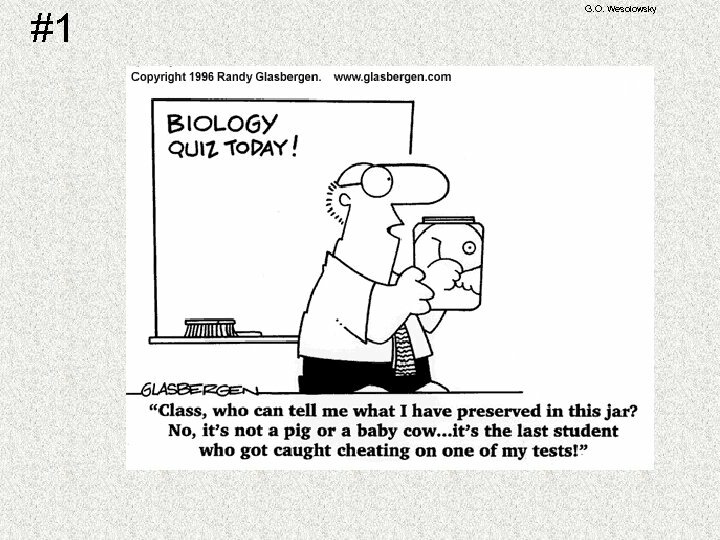 Scheck knows this. 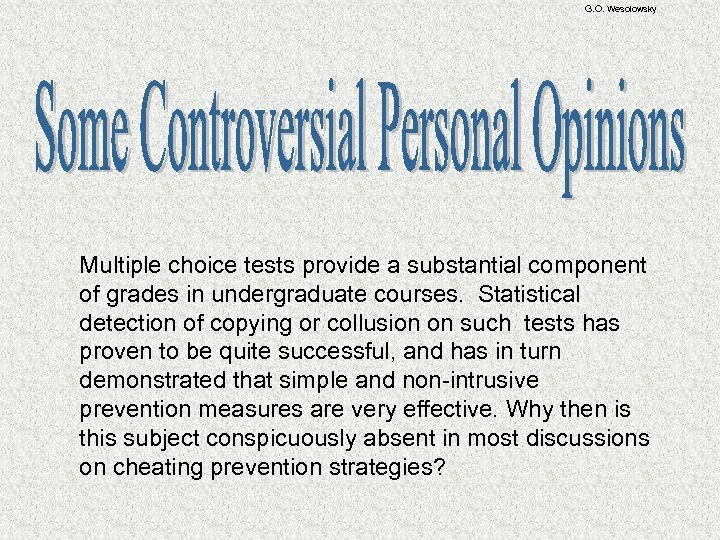 G. O. Wesolowsky Multiple choice tests provide a substantial component of grades in undergraduate courses. 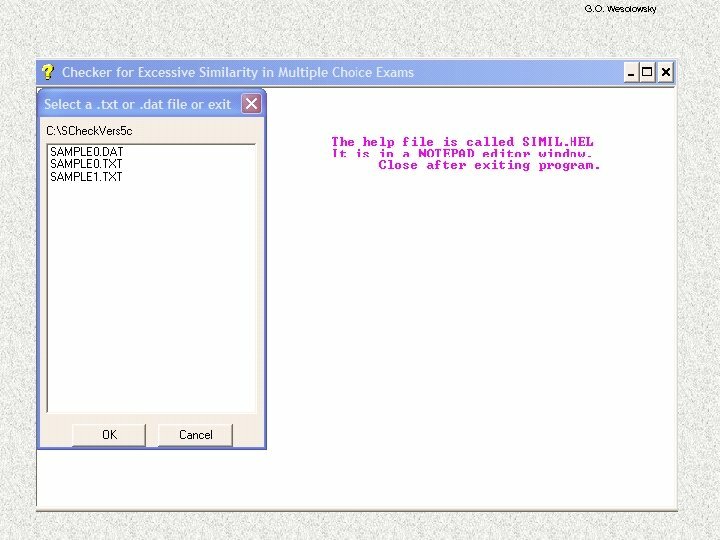 Statistical detection of copying or collusion on such tests has proven to be quite successful, and has in turn demonstrated that simple and non-intrusive prevention measures are very effective. 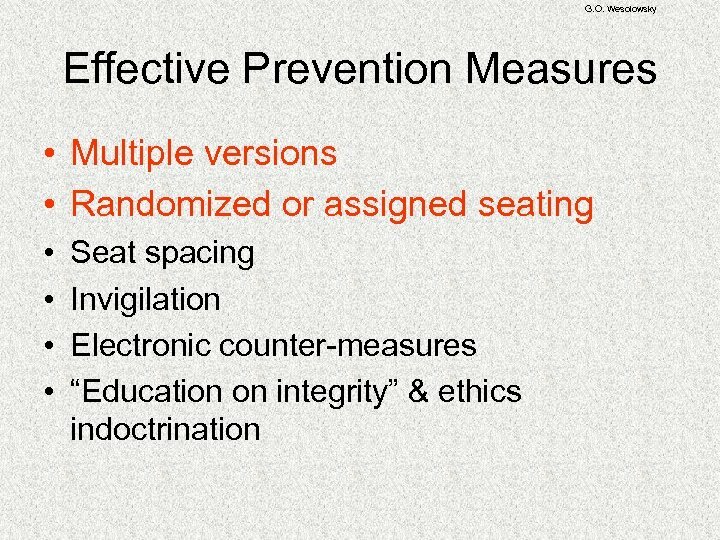 Why then is this subject conspicuously absent in most discussions on cheating prevention strategies? 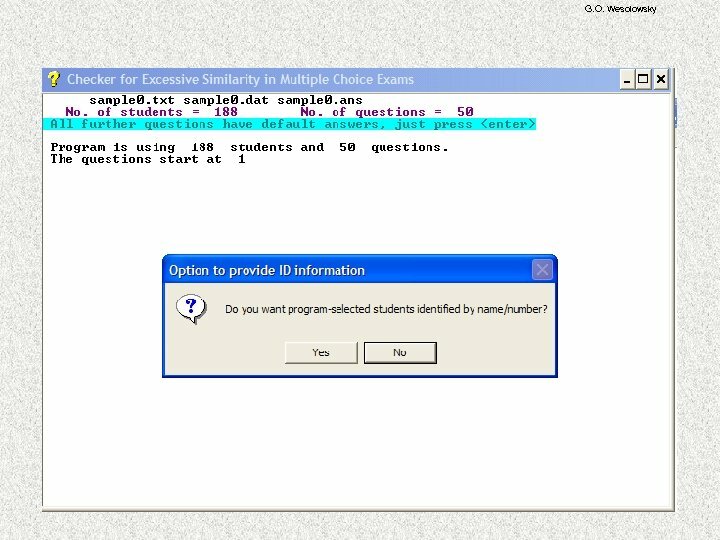 G. O. Wesolowsky Instructor Attitudes Instructor: Not on my tests you won’t! 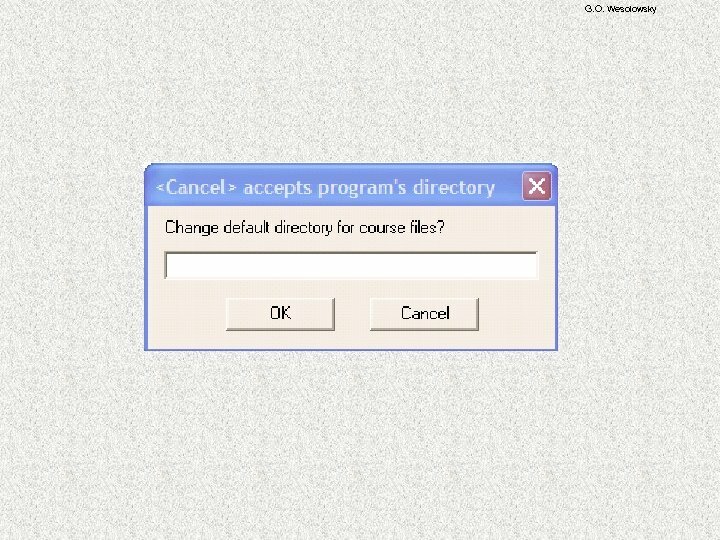 G. O. Wesolowsky Comments • Implicit assumption: The university’s main function is to provide an education and grades are merely an unimportant side-issue. 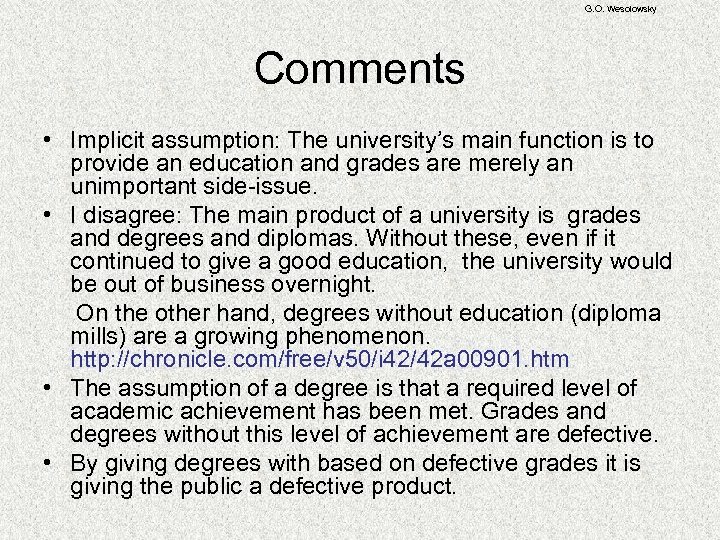 • I disagree: The main product of a university is grades and degrees and diplomas. Without these, even if it continued to give a good education, the university would be out of business overnight. 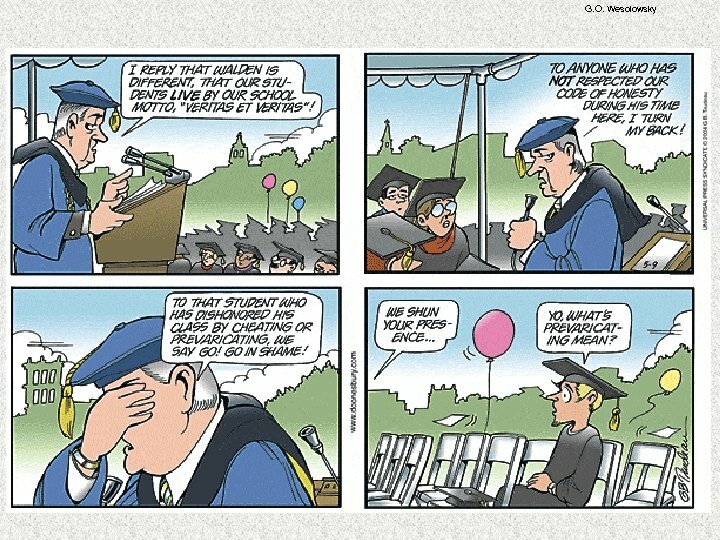 On the other hand, degrees without education (diploma mills) are a growing phenomenon. http: //chronicle. 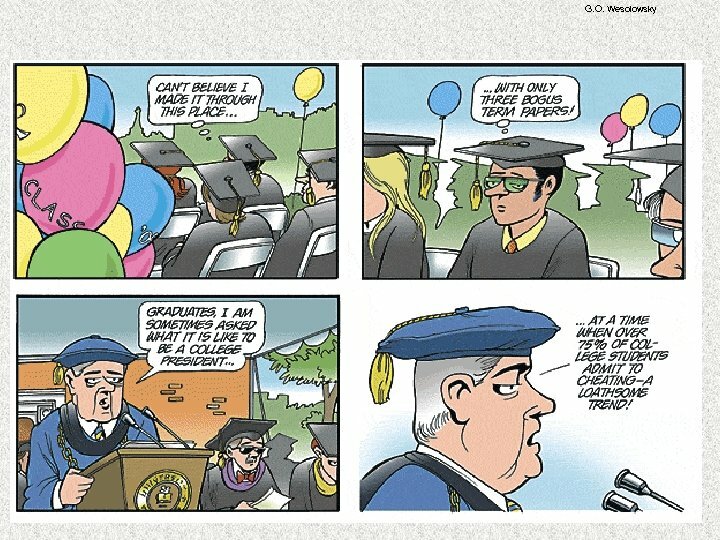 com/free/v 50/i 42/42 a 00901. htm • The assumption of a degree is that a required level of academic achievement has been met. 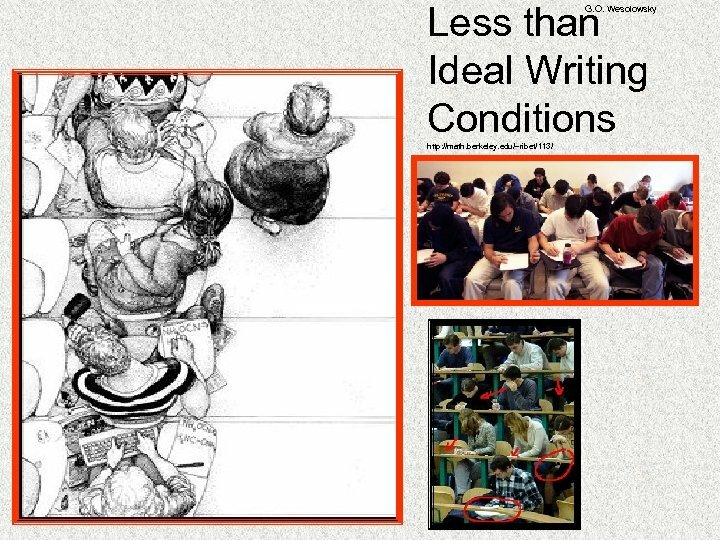 Grades and degrees without this level of achievement are defective. 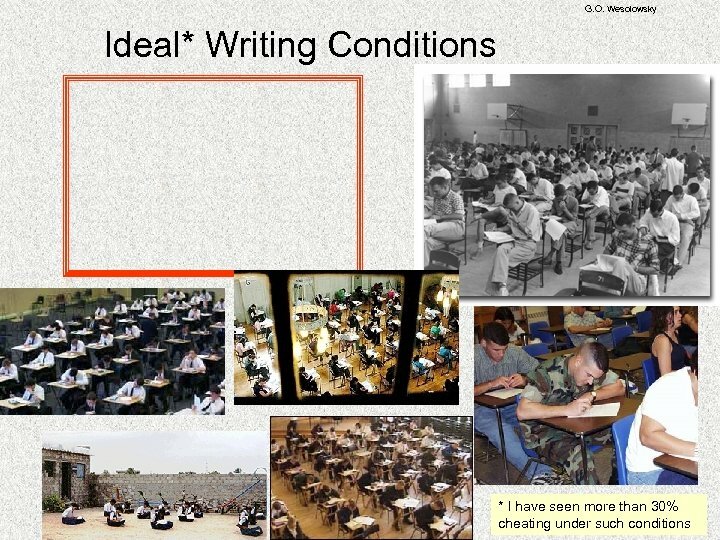 • By giving degrees with based on defective grades it is giving the public a defective product. 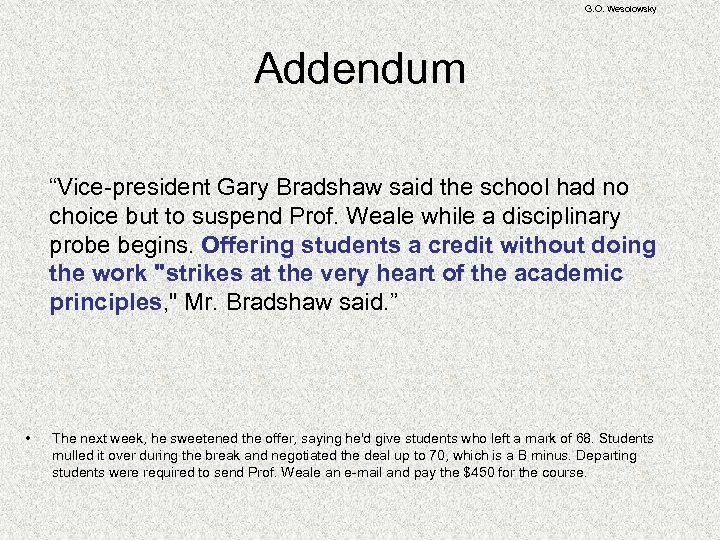 G. O. Wesolowsky Addendum “Vice-president Gary Bradshaw said the school had no choice but to suspend Prof. Weale while a disciplinary probe begins. 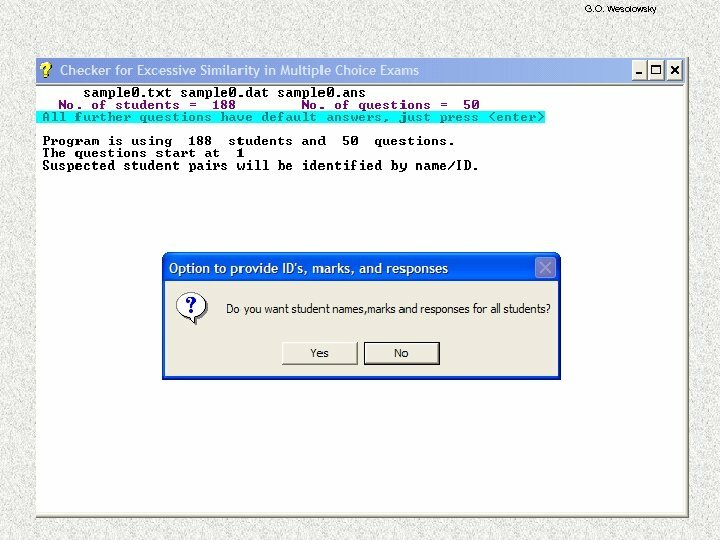 Offering students a credit without doing the work "strikes at the very heart of the academic principles, " Mr. Bradshaw said. 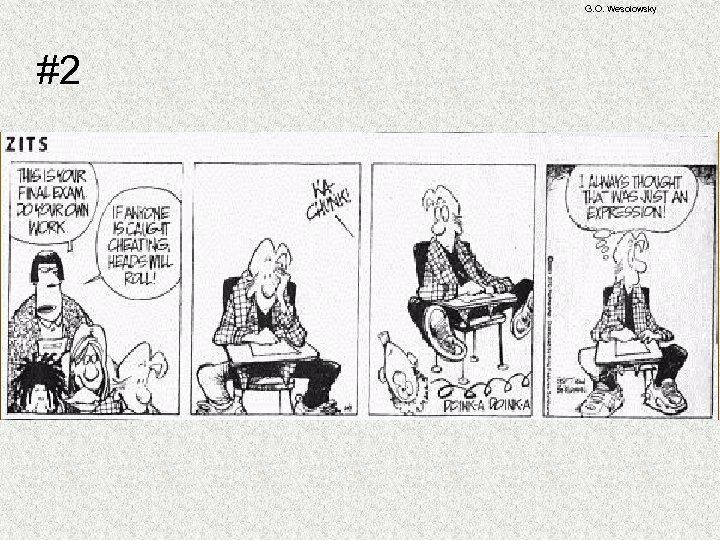 ” • The next week, he sweetened the offer, saying he'd give students who left a mark of 68. 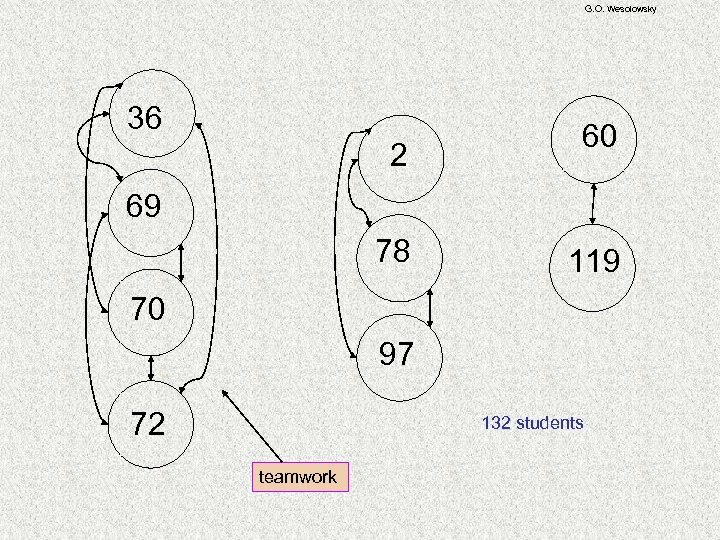 Students mulled it over during the break and negotiated the deal up to 70, which is a B minus. 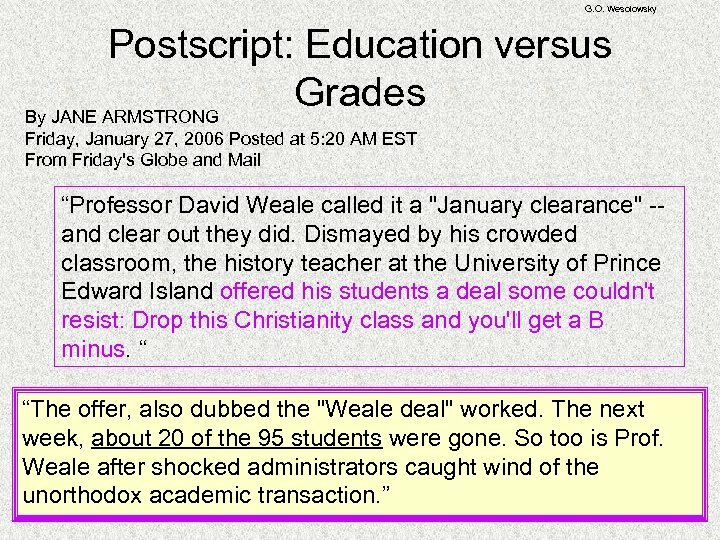 Departing students were required to send Prof. Weale an e-mail and pay the $450 for the course. 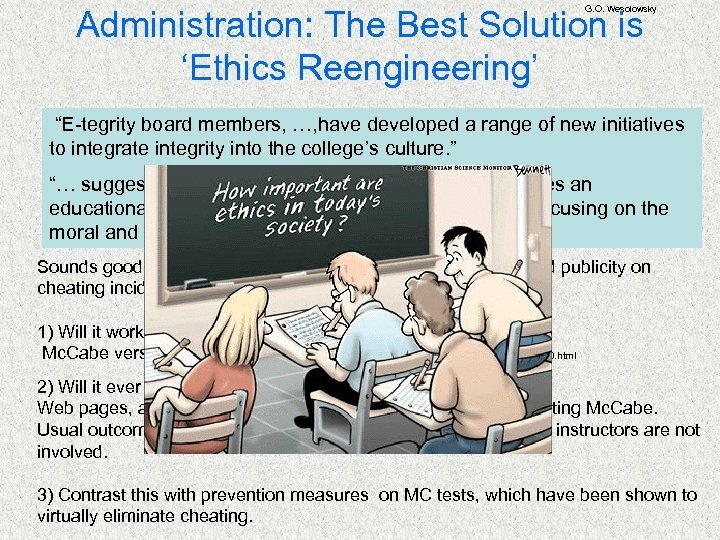 G. O. Wesolowsky Administration: The Best Solution is ‘Ethics Reengineering’ “E-tegrity board members, …, have developed a range of new initiatives to integrate integrity into the college’s culture. 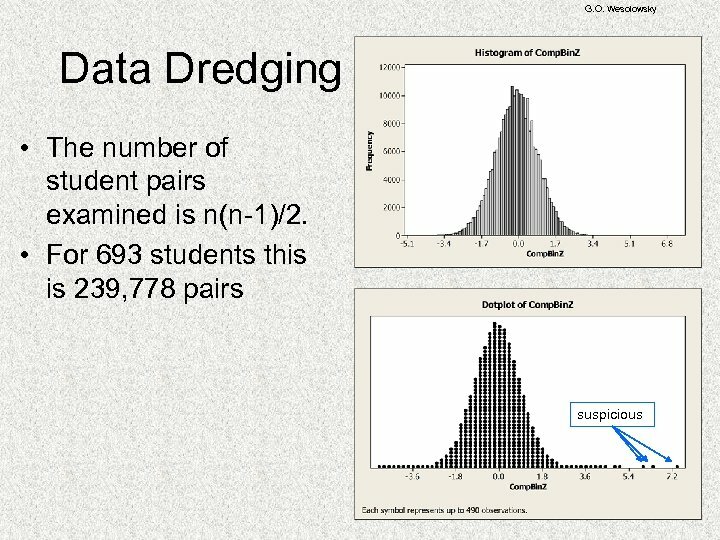 ” “… suggest a more broadly focused approach that creates an educational community valuing academic integrity and focusing on the moral and ethical development of students” Sounds good and plays well in the media. 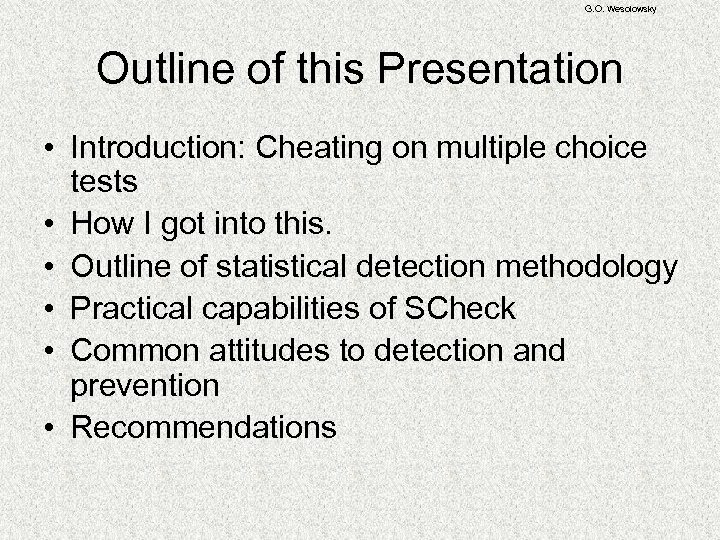 Often arises out of bad publicity on cheating incidents. 1) Will it work if it is seriously implemented? Mc. 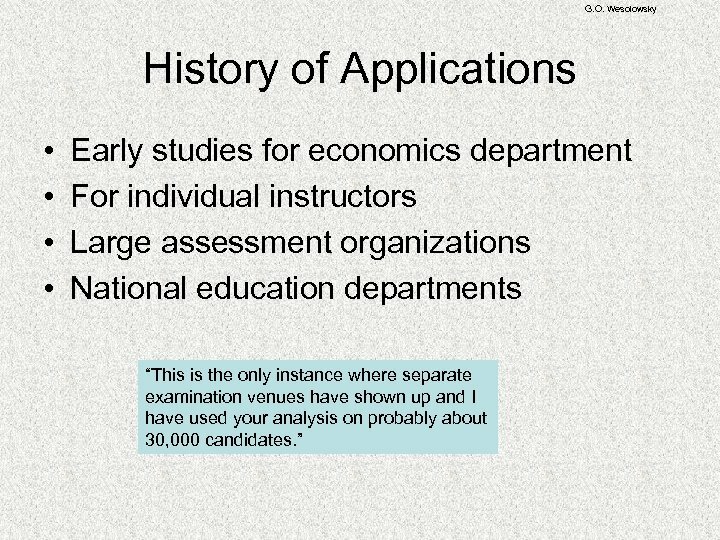 Cabe versus the economists http: //www. arts. 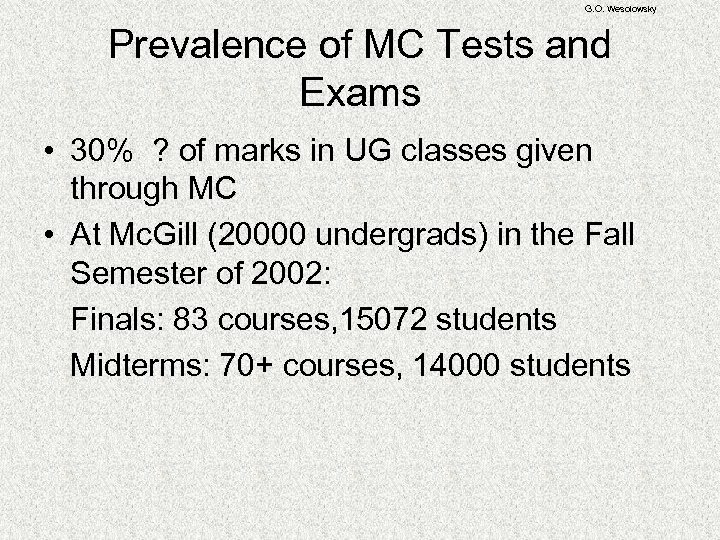 ubc. 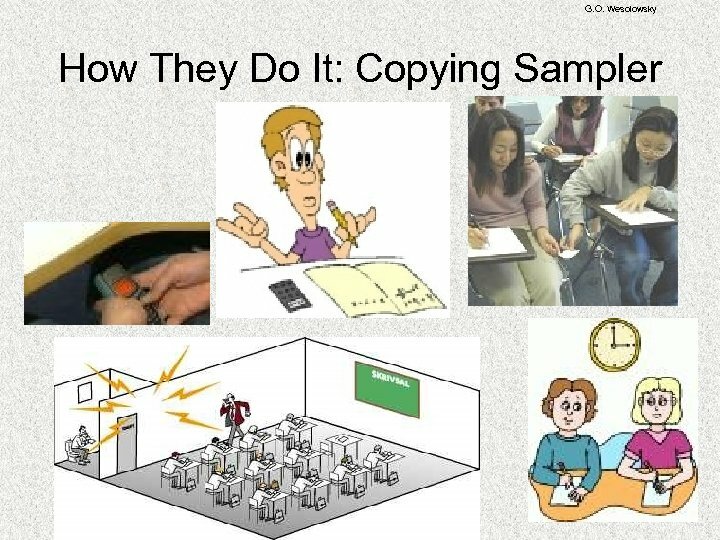 ca/Why_Students_Cheat. 116. 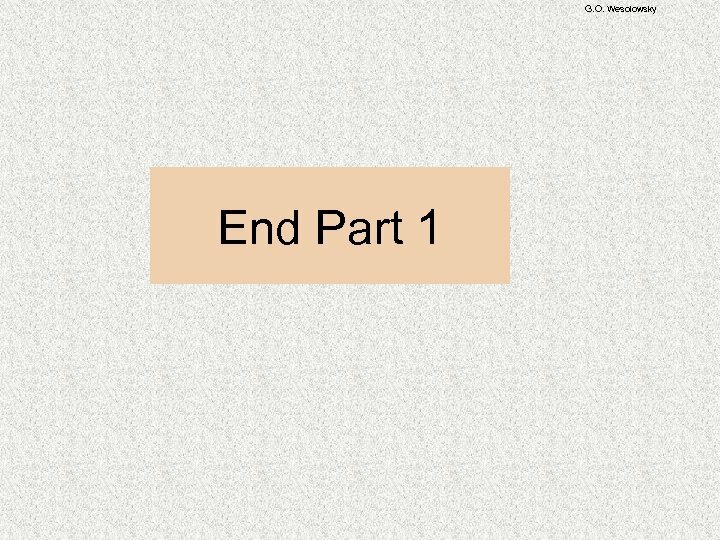 0. html 2) Will it ever be implemented beyond the talk level? 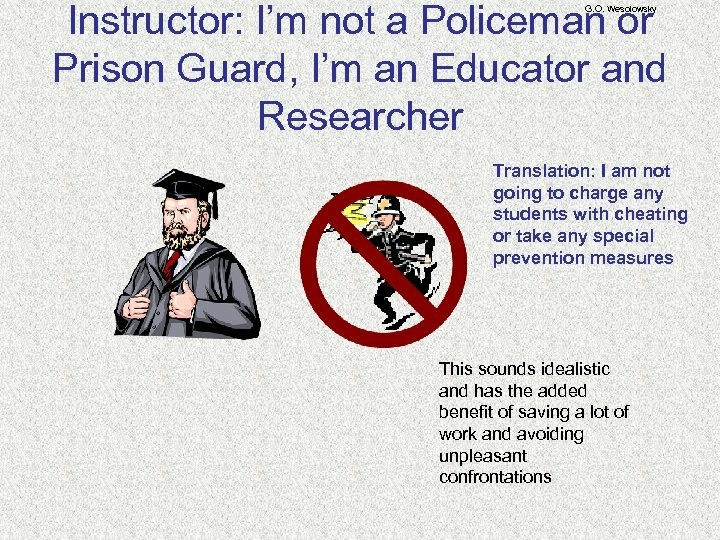 Web pages, articles in school newsletters, “integrity officers”, inviting Mc. Cabe. 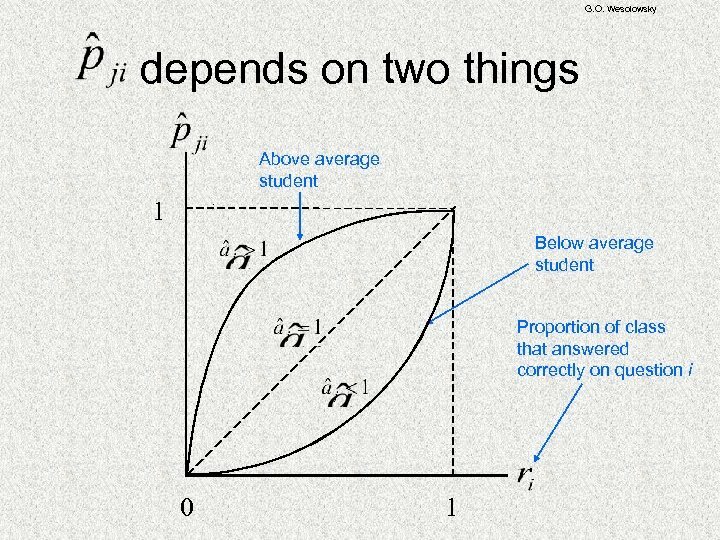 Usual outcomes: a) effort fades away b) majority of students and instructors are not involved. 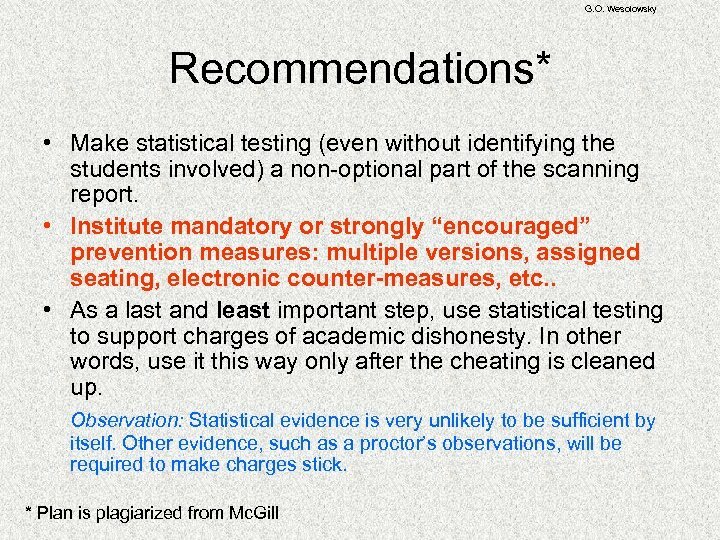 3) Contrast this with prevention measures on MC tests, which have been shown to virtually eliminate cheating. 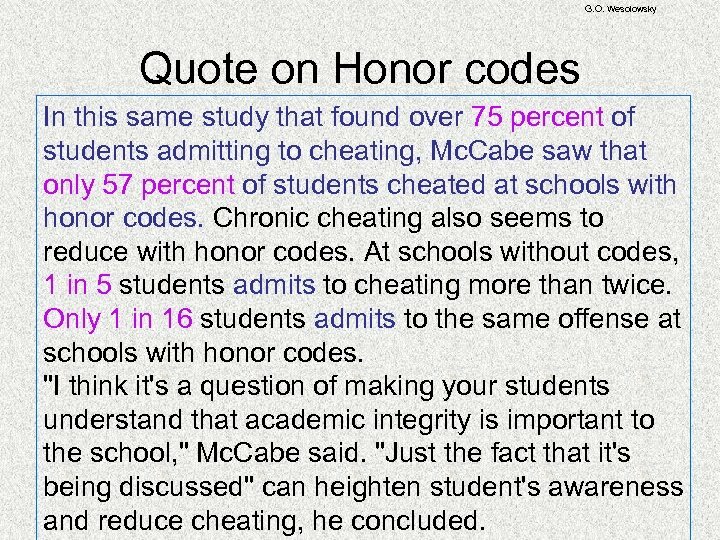 G. O. Wesolowsky Quote on Honor codes In this same study that found over 75 percent of students admitting to cheating, Mc. 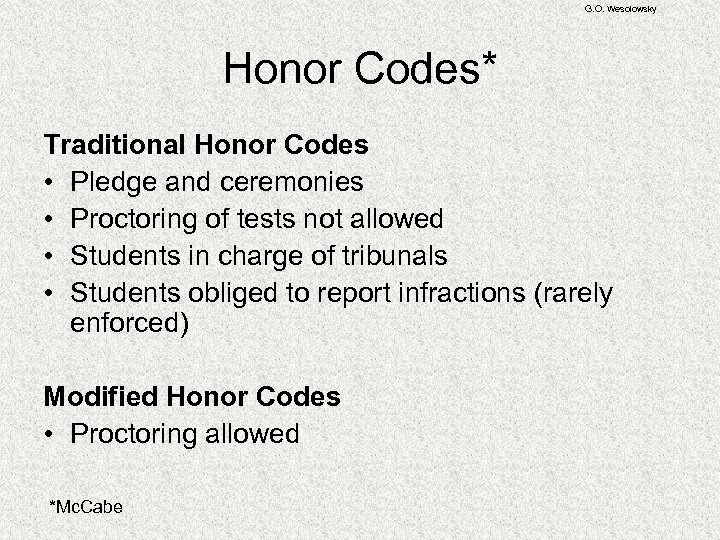 Cabe saw that only 57 percent of students cheated at schools with honor codes. 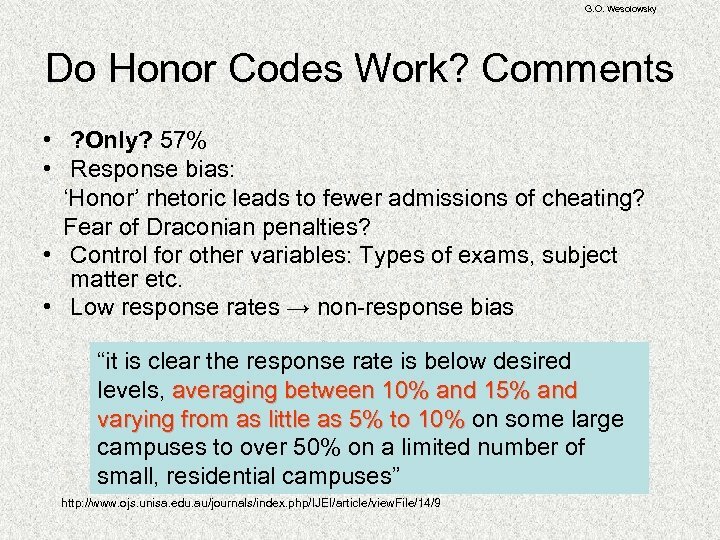 Chronic cheating also seems to reduce with honor codes. 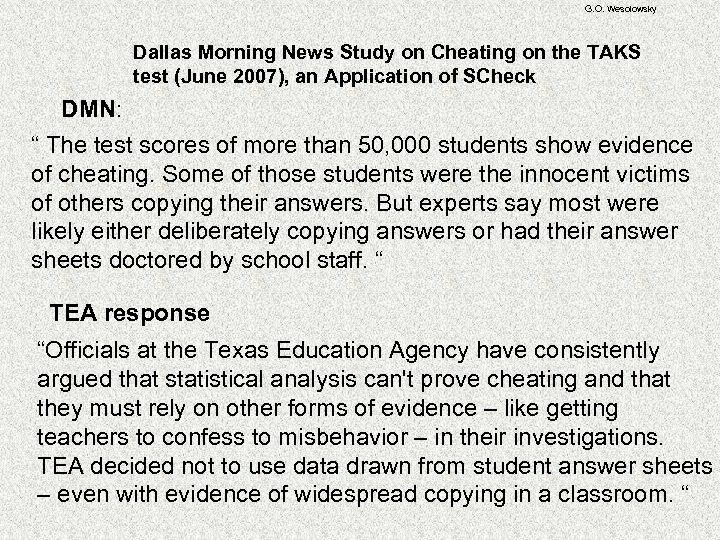 At schools without codes, 1 in 5 students admits to cheating more than twice. 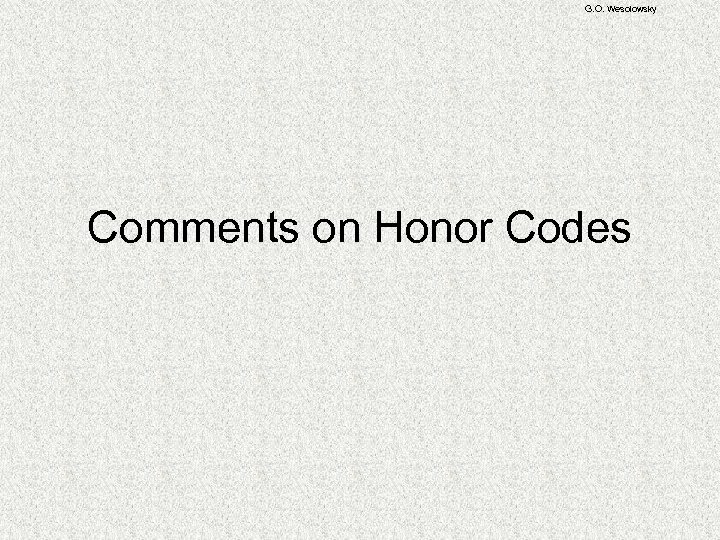 Only 1 in 16 students admits to the same offense at schools with honor codes. 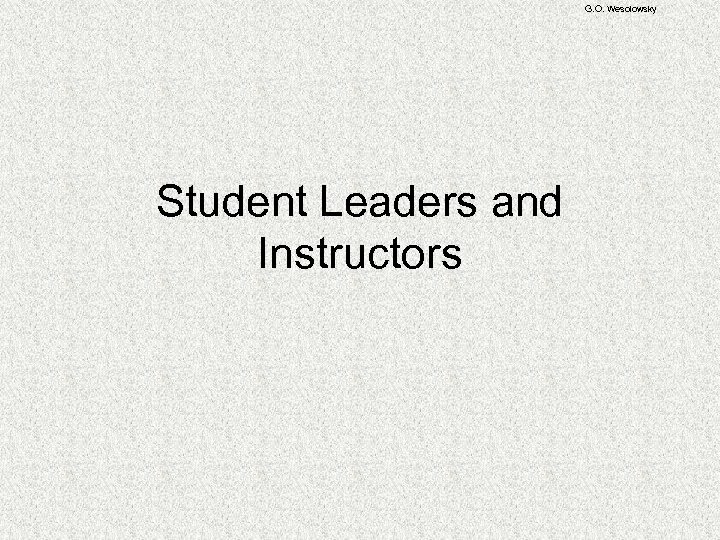 "I think it's a question of making your students understand that academic integrity is important to the school, " Mc. Cabe said. 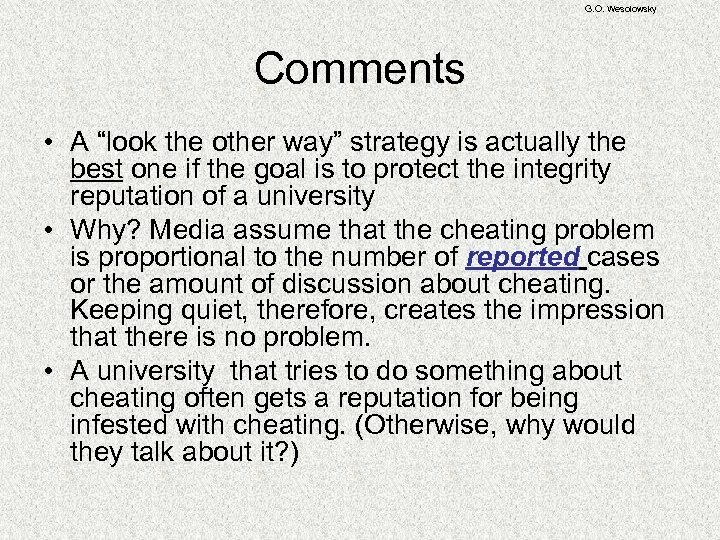 "Just the fact that it's being discussed" can heighten student's awareness and reduce cheating, he concluded. 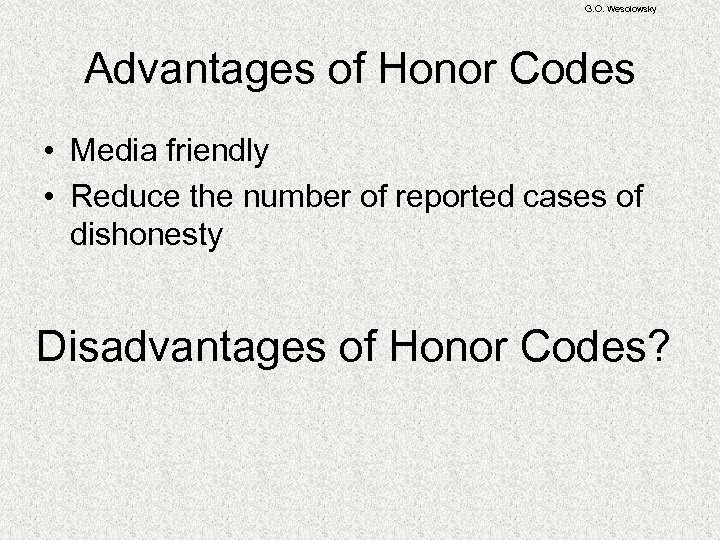 G. O. Wesolowsky Advantages of Honor Codes • Media friendly • Reduce the number of reported cases of dishonesty Disadvantages of Honor Codes? 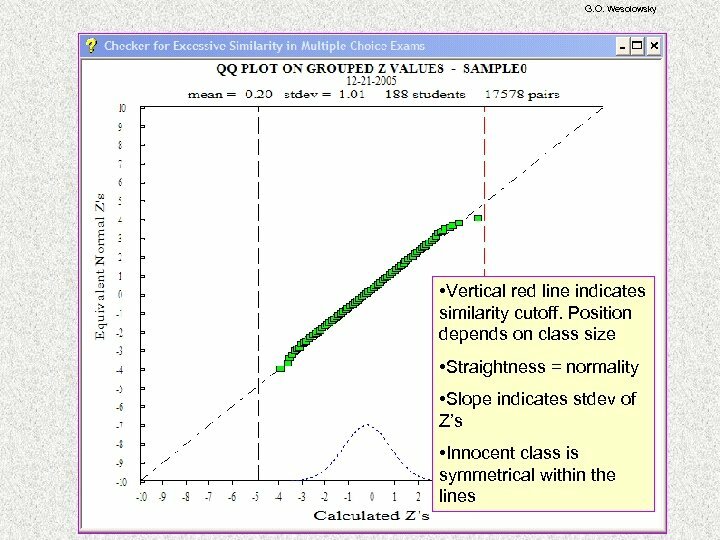 Introduction to Business Management: Statistics Class 1.